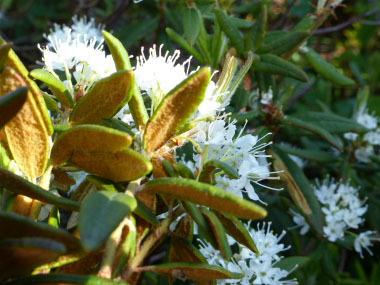 Labrador tea is a member of the heath family. 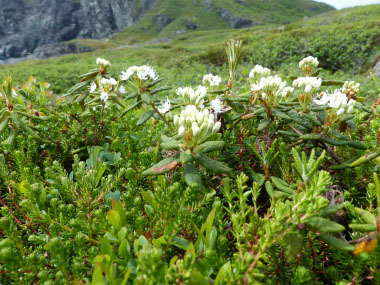 This plant is a useful ecological indicator because Labrador tea is characteristic of acidic soils with high moisture and poor nutrient regimes. It is often associated with black spruce. 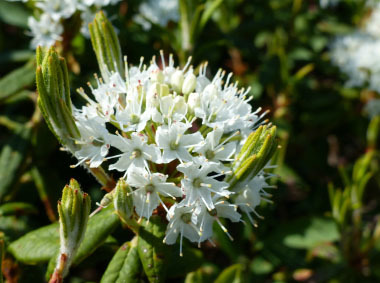 Labrador tea is a slow growing evergreen shrub and new shoots of the season originate at the base of the flower cluster. Interestingly, this shrub can generally survive fire as the rhizomes are found deep in the organic layer and it is often found in areas too wet to burn. It is one of the first plants to re-colonize after fire and grows rapidly. 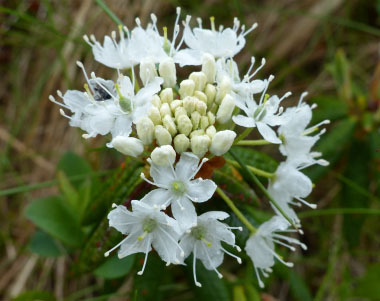 Distinguishing Features: Labrador tea is technically a flowering shrub with many erect branches, white flowers and distinctive evergreen leaves. When fully mature the leaves are very identifiable as the margins are curled under and the underneath of the leaves is rusty brown. It often grows in dense colonies. The plant spreads roots in the organic layer with rhizomes. 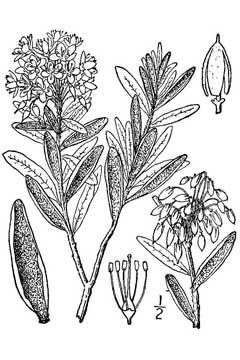 It reproduces generally by spreading vegetatively, and less commonly, from seed. 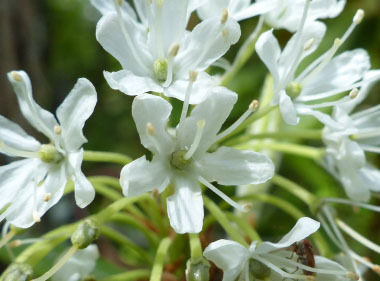 Flowers: Several white flowers occur in showy rounded umbel-like terminal inflorescences. Individual flowers are about 1 cm across; the calyx is small and 5-toothed; the corolla is composed of 5 white ovate to oblong petals, fused at the base. There are 5 to 7 stamens and the filaments are longer than the petals. Flowers blooms in June to early July. 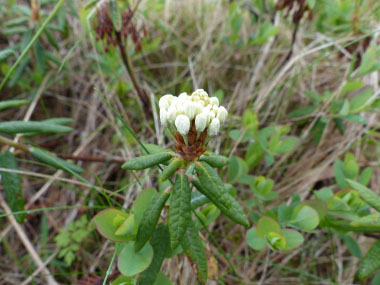 Fields of Nutrition has medicinal benefits and vitamin/mineral content of Labrador Tea. Leaves: Leaves grow alternate, simple, evergreen, fragrant when crushed, and have a short-petiolate. Leaf blades are narrowly elliptic to oblong, 2 to 5 cm (1 to 2”) long and 0.5 to 2 cm wide. 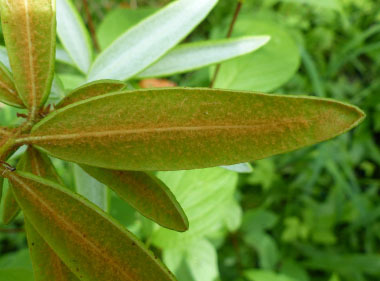 They have a leathery-texture, are dull and dark green above, with the lower leaf surface densely covered in matted woolly hairs that turn from white to rusty-brown at maturity. Margins are entire and slightly turned under. Height: This plant can grow up to 1 metre (3’) tall. 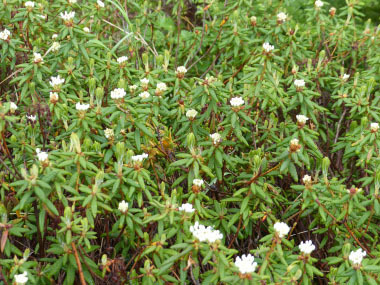 Habitat: Labrador tea prefers moist to wet peaty soils, especially in bogs and wet coniferous forests; also in peaty barrens. 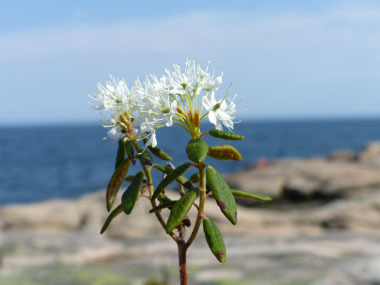 Labrador tea is native to boreal North America. It is found in the tundra and also in drier, rocky places in the mountains. 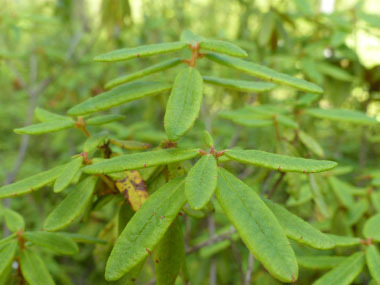 Edible parts: The fragrant leaves are used as a soothing tea and they have many medicinal uses. Add lemon to make an iced tea. Leaves were once used in beer making to make it heady. Flowers can also be used to make tea.